The Memorial commemorates the servicemen and women of the Dutch forces which operated from Australia between 1941 and 1945. The Dutch, along with the Americans, were the only non-Commonwealth countries to establish bases in Australia during World War Two. The memorial consists of two crescent-shaped walls with a mosaic map of the South-West Pacific Zone (the area of operations) by David Humpheries. The inside of the southern wall comprises five panels, the first displaying a shield bearing the bronze lion from the Netherlands Coat of Arms. 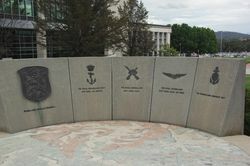 The other four panels are the badges of: the Royal Netherlands Navy and Naval Air Service, the Royal Netherlands East Indies Army, the Royal Netherlands East Indies Air Force and the Netherlands Merchant Navy. The original memorial was unveiled on the 7th December 1991 and the new memorial was rededicated in 1999. For a while they were part of the "front line" defence of Canberra, although few remember the part played by the Dutch armed forces in Australia's days of trial. Now, 50 years on, the Member for Fraser, John Langmore, has joined a committee to ensure the commemoration of men who escaped captivity and flocked to Australia in their thousands to use it, when the time came, as the springboard back to their homes. Political conditions after the war, however, had altered so radically in the former Netherlands East Indies (Indonesia) that most would be forced out again ultimately — many to emigrate to Australia. The armed forces of the Netherlands East Indies had remained loyal to the Dutch government-in-exile in London after the fall of Holland to German forces. When the London Dutch declared war on Japan on December 7, 1941, there was no hesitation in Batavia, which opened hostilities immediately. There had been considerable co-operation already in advanced preparations. During the hectic and tragic weeks that would see Japanese forces sweep through the whole of the NEI, Malaya, Singapore, the Philippines and much of Papua New Guinea, as well as most of Burma and to the gates of Australia, the Dutch fought stubbornly to try to stem the tide. As they were forced out of their islands, several thousand Dutch made their way to Australia by sea and air. Reformed quickly and re-equipped with whatever was available, the Dutch forces went into defensive positions in Northern Australia, ready to take up the fight again had the Japanese landed. There is no national memorial to the part the Dutch played in defending Australia. 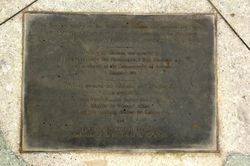 Now, however, the committee on which Mr Langmore is serving with the Netherlands Ambassador, the national President of the RSL, Brigadier Alf Garland, and the Netherlands Ex-Servicemen and Women's Association in Australia, hopes, by December 7, to dedicate a memorial next to the American War Memorial in Thomas Blamey Square. The committee hopes to raise about $100,000. Half a century after they came to our aid, the Dutch who fought alongside Australia's own beleaguered garrisons in those days when everything was on the table are at last to be remembered. The Canberra Times (ACT), 15th September 1991. The Royal Netherlands and East Indies Forces Memorial commemorates the unique partnership forged between service personnel of Australia and the Netherlands in the defence of the Netherlands East Indies and Australia during World War II.